Copyright law is important to every stage of media production and reception. It helps determine filmmakers' artistic decisions, Hollywood's corporate structure, and the varieties of media consumption. The rise of digital media and the internet has only expanded copyright's reach. Everyone from producers and sceenwriters to amateur video makers, file sharers, and internet entrepreneurs has a stake in the history and future of piracy, copy protection, and the public domain. 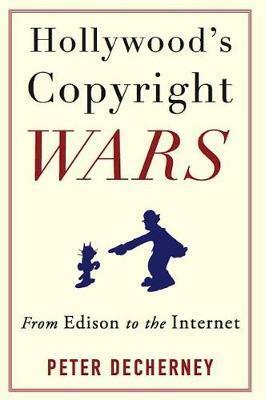 Beginning with Thomas Edison's aggressive copyright disputes and concluding with recent lawsuits against YouTube, Hollywood's Copyright Wars follows the struggle of the film, television, and digital media industries to influence and adapt to copyright law. Many of Hollywood's most valued treasures, from Modern Times (1936) to Star Wars (1977), cannot be fully understood without appreciating their legal controversies. Peter Decherney shows that the history of intellectual property in Hollywood has not always mirrored the evolution of the law. Many landmark decisions have barely changed the industry's behavior, while some quieter policies have had revolutionary effects. His most remarkable contributions uncover Hollywood's reliance on self-regulation. Rather than involve congress, judges, or juries in settling copyright disputes, studio heads and filmmakers have often kept such arguments "in house," turning to talent guilds and other groups for solutions. Whether the issue has been battling piracy in the 1900s, controlling the threat of home video, or managing modern amateur and noncommercial uses of protected content, much of Hollywood's engagement with the law has occurred offstage, in the larger theater of copyright. Decherney's unique history recounts these extralegal solutions and their impact on American media and culture. Peter Decherney is professor of cinema studies and English at the University of Pennsylvania and author of Hollywood and the Culture Elite: How the Movies Became American.